I posted three videos tonight that were really nice and thought I would share them with you. Thanks for being patient with the website as we start the major MAJOR changes. 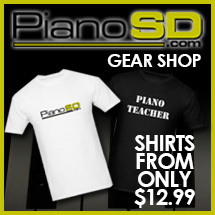 Of all of the things in the piano industry, I love piano teachers. I know, I know, I love the manufacturers, piano builders, tuners, technicians, artists, etc. but, teachers are the key to our industry. Heres some facts. Piano teachers generally speaking have the love and compassion needed to take kids into the next level. They have to deal with young men and young women as they come into and out of the most important parts of thier lives on a much more personal basis than the average teacher. As a child is going through the loss of a loved one, divorce of their parents, not to mention puberty and growing into young men and young women. Then theres school, school functions girlfriends, boyfriends, best freinds, soccer, football, cheerleaders and such. All the while they are doing their very best to work with the children through the situations. Piano teachers are teaching our kids to play the piano but also are adding to thier imaginations. Most people dont realize that learning to play a musical instrument helps kids increase their ability to learn. I have had a lot of pleasure teaching adults. Like teachers that teach kids I have listened to stories about everything from marriage problems to kid problems and financial problems and every possible topic in between and loved every minute of it. Saints Go Marchin In, you would have thought he had just won a lottery. Yet, he had it in him all along and simply needed an avenue and permission to get it out. At the Piano Outlet in Nipomo, Ca. I have begun classes that are for adults and another teacher is teaching the children. If you are interested in joining one of our classes or are interested in learning on line, please contact me and I will get you into one of our classes.